Description: County map. Allegorical map. Mythical figures. Description: Norfolk. A fine map of the county from the uncommon 1623 edition of Speed's seminal atlas, 'The Theatre of Great Britaine'. Vignette of Norwich. Description: County map. Original colour heightened in gold. Description: County map. Decorative cartouche. Original colour. Description: This early map of Norfolk is embellished with a ship and two cherubs. The dedication is to Henry Howard, Baron of Castle Rising and Earl Marshall of the Kingdom. Description: County map with inset of Norwich. Overton edition with added road system. Coloured. Description: The roads from Colchester to Great Yarmouth through Ipswich. From Ogilby's "Britannia" atlas, first published in 1675. Coloured. 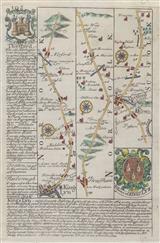 Description: Sweet miniature road map from Norwich to Yarmouth, with descriptive text. Coloured. 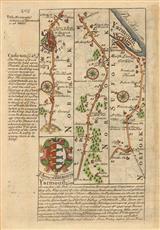 Description: Early road map presenting the route from Kings Lynn to Thetford. The text gives context to the major settlements along the journey. Coloured. Description: Norfolk highlighting cities and towns, with a decorative cartouche. Coloured. Description: County map. Inset text and tables. Original colour. Description: Yarmouth. Town plan and harbour. Description: Superb 18th-century map of the city of Norwich with vignettes of the castle, cathedral, theatre, and guild hall. Important buildings, including the city's famous medieval walls, are shown pictorially. Description: A rich and detailed map of Norfolk taken from Bowen’s landmark survey of Georgian England. Original colour. 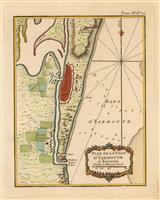 Description: Coastal survey of the port of Yarmouth and environs from Collins's important survey. Black and White. Description: Norfolk. Miniature county map. Coloured.